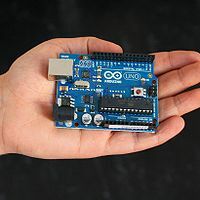 The Arduino is an open design for a micro controller board suitable for hobby projects, art installation, and robotics. The board consists of a single microcontroller, or processor, and a series of onboard sensors, plus additional electronic connection banks for inputs and outputs to, basically anything that will accept or produce an electric signal (ie. Switches, electronic thermometers, LCD displays, LED’s, etc). 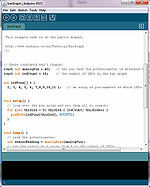 To program the microcontroller, a user has available to them a easy to use programming language that is similar to C++. Based on a similar language, Wiring, the Arduino has two functions that must exist in each program. Setup(), which initializes any and all of the input and output pins the Arduino will use with that program installed, and Loop(), which will run in a constant loop on each successive clock-cycle of the microcontroller, which the Arduino is powered. Currently there are 13 versions of the Arduino Boards available. Produced by Smart Projects, in Italy, they range in both size and capabilities. The Arduino is licensed under the Creative Commons Licence – Share Alike 2.5. This licence essentially allows users of the Arduino to adapt and modify the Arduino board however they would like, provided they attribute any work used to the original author (though that does not necessarily mean the original author endorses the changes), and that they are only allowed to redistribute the work with the same licence. The Arduino Programming software is licensed under the General Public Licence (GPL or LGPL). This licence allows users of the programming software to modify the software to whatever need they need to fill and redistribute it provided they pass all required source code, as well as the same licence, to subsequent users. The Arduino project was the brain child of Massimo Banzi, David Cuartielles, Gianluca Martino, David Mellis, Nicholas Zambetti, and Tom Igoe, who began the project at the University in Ivrea, Italy, in 2005. The idea was sparked when it became apparent that many students wanted to use the functions of a simple electronics microcontroller for their art and design projects, but the only options available, at the time, were either too expensive for the simplistic nature of the projects, or too complicated for a student with not experience in microelectronics to understand or implement. Thus, the founders banded together to design an open source electronics board, keeping their art and design students, as the end user, in mind. “We wanted a tool to teach physical computing, specifically microcontroller programming, to artists and designers, who we teach. The assumptions of those coming at it from a background other than computer science (CS) or electrical engineering (EE) are quite different, and we wanted tools that matched those assumptions.” ComputerWorld 2009. Since its release, the Arduino has created a venue for all types of interesting and unique implementations of simple electronics, as part of all types of projects. Millions of people around the world are able to test out their ideas, most of which may have never been able to do so before. The Arduino is also an example of a product using the creative commons license that works. The Arduino has been used in many different projects, in many different forms, and those projects have since gone on to be used in different projects in different forms. The Arduino has also sparked the creation of many books on best practices for using the Arduino, some of which are used in instructional classes that also use the Arduino as a teaching tool. Most of them don't actually want to be programmers, they just want to use programming and circuits to get things done. That may mean making an art piece, or an automatic cat feeder, or a new occupational therapy device. These people are not formally trained engineers, but they want to build things. These are the students we teach. It's their way of thinking for which we designed Arduino." ComputerWorld 2009. Here are some examples of some interesting projects using the Arduino. Whole House Telephone - Enables house hold phone to double as an intercom. SlotCar Lap Timer - Scalectrics lap timer and counter, for slot-race-car enthusiasts. MouseGlove - Open Source version of, self described, "the future of the mouse"
Rear Eye - Wearable additional eye. Gimmie - Art Project- the "automated panhandler." Visit the Arduino Website's Project Page for more interesting projects using the Arduino. Morrison, Graham. "CIRCUIT-BENDING WITH ARDUINO." APC 28.6 (2008): 12-13. Computers & Applied Sciences Complete. EBSCO. Web. 13 Nov. 2010. Buechley, Leah, and Michael Eisenberg. "The LilyPad Arduino: Toward Wearable Engineering for Everyone." IEEE Pervasive Computing 7.2 (2008): 12-15. Computers & Applied Sciences Complete. EBSCO. Web. 13 Nov. 2010. This page was last modified on 19 December 2010, at 18:45.